Some interesting matchups are coming this weekend in Major League Soccer, things are starting to get more interesting in the Eastern Conference as there is a new top team in the New England Revolution. The defending champs, Sporting KC are coming off two straight losses dropping them to No. 2 in the East standings. Out in Western Conference, the Seattle Sounders remain the dominant team, but Real Salt Lake is right behind them in points, as they are the only team in the league to have not suffered a regulation defeat. Here are the top 5 MLS tickets of the week. The LA Galaxy will host the Philadelphia Union at the StubHub Center on May 25. The Galaxy are dead last in the Western Conference and are in desperate need of a win. It’s been over a month since their last win. The Philadelphia Union are also a team struggling to win games but are coming off good performances against the top teams in the East, beating Sporting KC. LA Galaxy tickets have an average price of $72.38 with a get in price of $23.00. Tickets are up 5% for this matchup. Sporting KC is currently struggling coming off two straight losses including a loss to an inferior Chicago Fire team. They host the Toronto FC at the Sporting Park on May 23. Sporting KC tickets have an average price of $71.07 with a get in price of $36.00 as tickets are down 5%. The No. 1 team in the Western Conference will visit the BC Place to face off against the Vancouver Whitecaps on May 24. Seattle remains one of the hottest teams in the league winning 4 of their last 5 games and are coming off a grind out win over San Jose. Vancouver looks to derail this train seeking their third straight victory. Whitecaps tickets have an average price of $70.73 with a get in price of $49.00. Tickets are up 13% over the past week. The New England Revolution have been on a tear lately winning 4 straight games displaying a great attack in their last game against the Union. They will host DC United at Gillette Stadium on May 24. New England Revolution tickets for this matchup have an average price of $45.00 with a get in price of just $16.00, and are currently up 8% over the past week. Real Salt Lake will host FC Dallas at the Rio Tinto Stadium on May 24. Real Salt Lake are one of the hottest teams in the league. They have yet to lose this year and have won three straight. They will face a FC Dallas team that is currently struggling and are winless in their past five games. 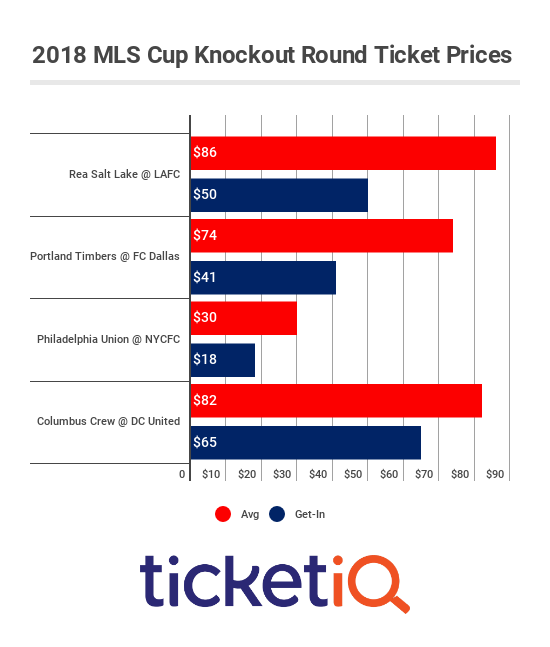 Real Salt Lake tickets for this game have an average price of $45 with a get in price of $18 as tickets are now up 3%. If LA Doesn’t Win, We’ll Buy You Tickets!